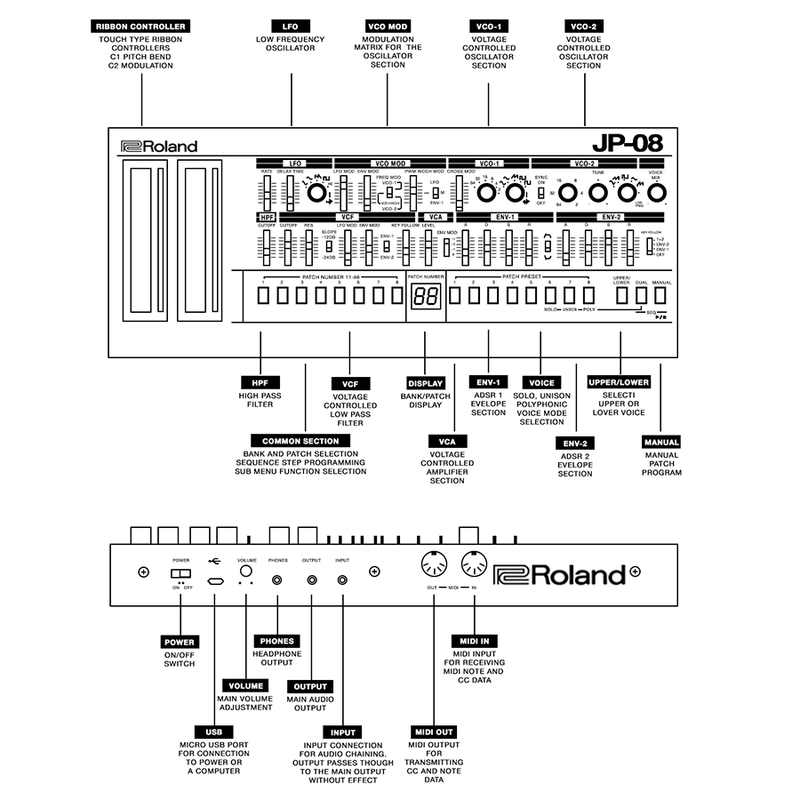 The minute I illustrated and re wrote up the missing manual for the JU-06 available with some patches hoping to encourage people to get deeper into their Roland Boutique modules, people began asking me to produce something similar for the JP-08 and the JX-03. I love a good technical illustration, and I really love a deep read of a vintage synthesizer manual, so I’ve produced the missing manual, a user’s guide to the JP-08. It’s the same basic idea as before – Take the leaflet that comes with the Boutique synth and all of its specifics, and combine it with the language for sound design from the original manual for the classic synthesizer, and then illustrate it. I’ve done just that, and so be aware that the language in the original Jupiter-8 manual is a little dated. I love it… but it may not be as direct and straight forward as you might have expected. That said, all the functions, key combinations, utilities, effects, and the sequencer operations are clear as a bell. I’ve even got lovely midi charts, and patch note pages for your patch programs, and for you bank arrangements too. Don’t be dissuaded, there’s a lot there. Reading this manual will help to understand how the LFO functions, and how interesting it can be to Modulate the VCO, as well as what a weirdo blast it can be to combine VCO’s in different ways. I think if you read up, and follow along your JP-08 will really surprise you. I have also included a bank of patches for you to play with in order to see how easy patch sharing can be, and also to discover how amazing this chorus feature is. NOTE – Be sure you backup JP08_PATCH57 – JP08_PATCH64 and PATTERN BQ_PTN7 and BQ_PTN8 BEFORE you begin this exercise. In accordance with the new, clearly written manual on page 10, follow these instructions to backup your sounds before you begin. 5. Create a backup folder for your sounds, and drop them all onto it and copy them over to your desktop. 1. Follow the procedure above for mounting the JP-08 to your desktop. 2. Copy the contents of the BANK 8 folder you downloaded from me into the RESTORE folder. Lights will bllink and things will happen. 5. When the lights stop blinking the screen should say OK. Play the C1 note on your keyboard. This should be the kick patch I gave you. Enjoy the manual. I hope this helps you get to know your JP-08 from a new perspective, and you get deeper and deeper into it and more sound and joy out of it. As much as I like the current Roland products, I hate their newspaper folded crap they substitute as a manual. It’s the only thing I dislike about the whole Aira range….the documentation. Wow! That didn’t take long at all! Thank you so much! Thank you ! Must have been a lot of work. Thx so much for taking the time! Well done! This will be VERY helpful and is truly appreciated. I love the JU-06 one and was hoping you would make one for the JP-08. Didn’t expect it so soon. Thanks! Wow! Thank you, thank you, thank you Sunshine! Have one coming for my brand, the JX-03? @ Edward Piercy – Yes. JX-03 is planned. This edition is to be updated on Monday. The JP-08 is missing the hidden chorus feature and it seems I didn’t swap the “chorus” for the “dual” button in at least one operation. So there’s a revision coming. I don’t have one, but this makes me want to get one. Hey, Sunshine! Would be awesome to get your opinion how close is the JP-08 in sound and performance is to the Jupiter-8 considering size and voices? @Shane – Well… if i had to choose i would choose the Jupiter-8 in a heartbeat. no regrets. That said, i personally destroyed a Jupiter-8 trying to tour with it back in the 1990’s and i would NEVER do that again. but we could spend the afternoon tossing the JP-08 onto the highway and taking bets about which truck was going to run over it, and when we were done we could head to guitar center and buy another one! These boutiques delight me because they democtratize the synthesizers which have passed out of reach of the people making music and touring at the ground level. I love my JP-08. it sounds great and it fits into my book bag. but if you could get your hands on a jupiter 8 instead… You should. Thank you, Sunshine! You’ve always been so kind and helpful to the community. Sweet synth gods, thank you Sunshine!! Your manual couldn’t have come at a better time! I’m just now doing a deep dive on the JP-08 to integrate it better within my setup. Really liking the tone and style in which it’s written. Thank you for an easy to read manual that is truly for the users. JP-08 sounded great…but the original manual and fiddly button combos made me sell it. I will consider it again now! Chido vato que buen aliviane ese. La negra. Thnx. Just Got one of these as a Christmas present, I couldn’t believe how poor Roland’s original manual for the jp08 is and how great your is!. The ‘hidden’ chorus feature is a revelation too. Thank you for your efforts, hope you get some credit from Roland for filling the gap in their documentation together with the gratitude of all users!.